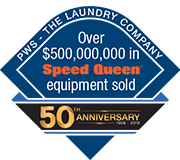 Machines with the simple coin slide control gives users the choice of multiple speeds, wash/dry cycles, and temperatures. Basic and dependable, this control panel offers convenient features, such as water and cycle selections and an electronic timer. Available in electronic and manual operation, these simplistic, stylish controls offer a variety of cycle and temperature selection.